It seems simple enough to make milk tea. Just add milk to your cup of tea. But this is a milk tea mistake. Making good tasting milk tea takes a bit more effort. 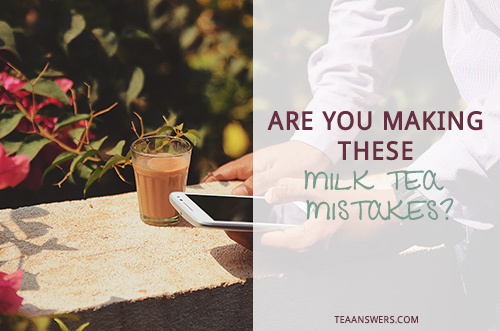 Here are some common milk tea making mistakes and how to avoid them. When cold or separately heated milk is added to spiced tea, the flavors have not mingled. It will just be – spiced tea with milk. Chai tea made with cinnamon, cardamom, ginger, black pepper, cloves, black tea, milk and sugar is the favorite drink of many in Pakistan, India, Nepal, and Mongolia, as well as travelers who go to these countries and surrounding regions. Each area has a different way of making the tea from simmering the spices in the milk and adding tea and sugar later for chai in India to heating milk together with water, adding the spices, sugar and tea and then, boiling this mixture several times for chai in Nepal. Heating the milk with the spices, tea, and sugar creates a caramel flavor and a somewhat thicker feel to the chai. It’s the melding of the ingredients that gives spiced milk tea the true chai flavor. While the British prefer milk in their tea, the French prefer lemon. Adding milk and lemon to the same cup is a milk tea mistake. Adding lemon to tea with milk causes the milk to curdle, which will leave lumpy milk floating in your nice cup of tea. Additionally, the tea will have an unpleasant taste. For a quintessential cup of British tea, add milk. But to make it correctly, add milk to the teacup first then pour in the tea. Adding milk before the tea, allows the tea to warm the milk while at the same time, cooling the tea. As there is more tea than milk, this method mixes the tea and milk together for a blended milk tea taste. If the tea is poured into the cup first and the milk then added, the first flavor in the cup will be of milk or at best a weak tea taste. Additionally, the first sensation when drinking the tea will be a cold or cool touch from the milk as it will still be floating near the top of the cup. Stirring the mixture before drinking will help, but adding the milk first eliminates a step (stirring) and lets you drink your tea much sooner. The water content of regular milk dilutes the flavor of the delicious Malaysian drink teh tarik. In addition, the tea will not have the caramel and vanilla flavors found in condensed milk. Condensed or evaporated milk is required to make milk teas in many Southeast Asian cultures, such as Malaysia. Condensed milk is made by heating milk until approximately 60 percent of its water is removed and then adding sugar in a ratio of 1:1. Heating the milk and adding sugar gives the milk a sweet caramel-like flavor. For evaporated milk, the same process is used except, no sugar is added. To make Malaysia teh tarik (also called pulled tea), brew the tea and add condensed milk (traditional) or evaporated milk (no-sugar style). Pour the mixture back and forth between two cups or glasses until there are foamy bubbles on the top of the milk tea mixture. When fresh milk is unavailable, dry or powdered milk is a reasonable substitute for making tea with milk. The rule to remember is that the dry milk should be reconstituted with water before it is added to the tea. Follow the directions on the package of dry milk for making the milk. Once done, add the desired amount of milk to the tea. I hope knowing how to avoid these common milk tea mistakes helps your next cup of milk tea be even better!